The best way to make a relocation decision is to spend a few days at the community you are considering. 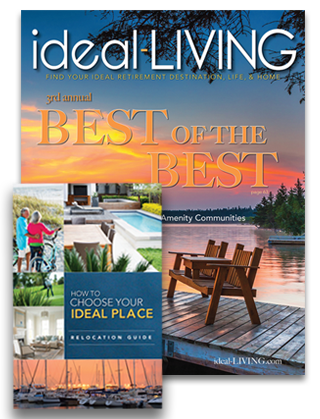 Whether you are moving for a job, escaping the bitter cold weather, or looking for a place to retire, why not try a community that many consider one of the best places to live in Florida? Eat at the club, work out at the fitness center, play some golf or tennis, and talk with as many residents as you can. We invite you to experience Amelia National Golf and Country Club first hand and spend a few days with us. Packages start at $340 + tax per couple. We invite you to enjoy the Amelia National Package. Please be our guest as you explore the abundance of lifestyle and resident options that await you at Amelia National. *$340 package is based on current offering, seasonal rates may affect final pricing. Pricing based on double occupancy taxes not included. Please contact Amelia National staff for details. Package only available for first time visitors and guest of Plantation Bay c/o ICI Homes. Offered on a first come first served basis, limited availability. Restrictions may apply. Subject to change without notice. Check in after 4:00pm and check out by 12:00pm. Full amount due at booking. Seven day advance to cancel with no penalty. Sorry, we can not accommodate pets but can refer a kennel to you for the courtesy of our guests. Extended stay available upon request dependent on room availability. The only way to appreciate ALL that Amelia National has to offer is to experience it for yourself. Schedule your visit by booking a Discovery Package with us.